No, I have not died. We finally got over being sick and started head-first into spring planting season. But we (we? 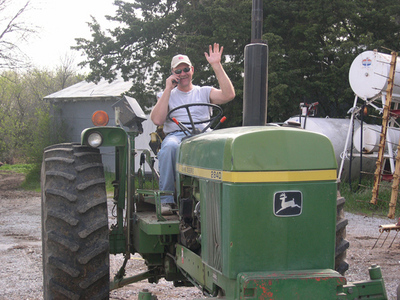 LOL Ok-- Farmer-dear ) are/is done with the corn, after mudding in the last 20 acres in the rain. Since Thursday night we have had 5" of rain! Our pond is FULL!! 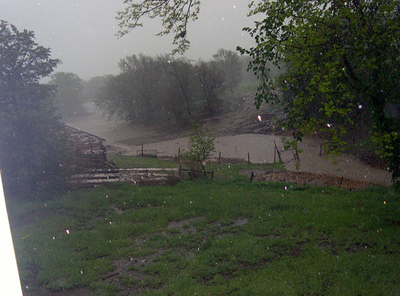 The culvert under the road in the lot could not handle all the water coming down the gully and we had stranded cows on the north side of the pond. 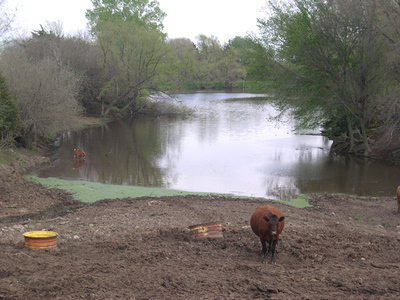 Farmer-dear waded out in the muck & mire and opened up the lean-to on the barn so they could get to the pasture south of the house. They were thrilled to get into green grass and out of the mess. 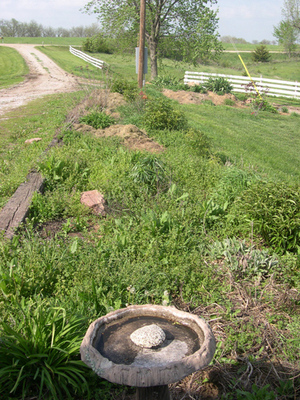 Here is the pond at a more normal size. Notice the cow in the foreground? This is the one Farmer-dear was sure would calf wayyyy back in January when he had his surgery. Guess what.... She STILL hasn't had that calf (as of May 6th)!! Here is the normal view of the gully when it is not flooding. 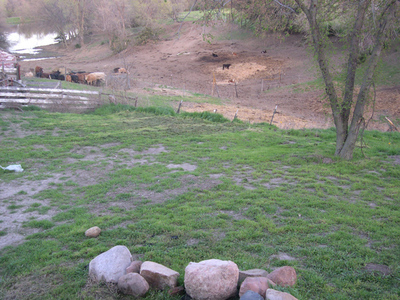 The pasture behind the house. (Sorry about the downspouts in the shot. ) 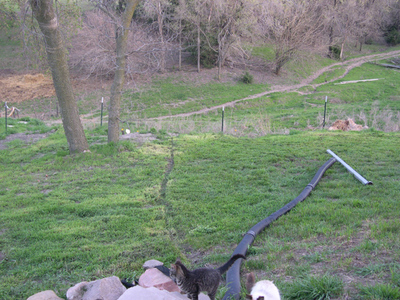 Those are the cattle trails/paths, not streams. And a little further west into our back yard. 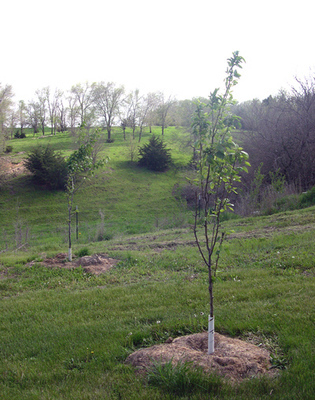 Please notice the new trees that we grubbed out and replanted after the house renovation. They are growing like mad and soon I'll have shade in the back yard again! 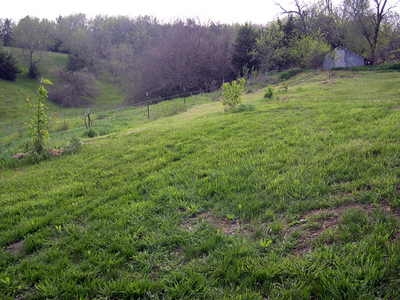 Another shot of the south pasture and our pear trees. 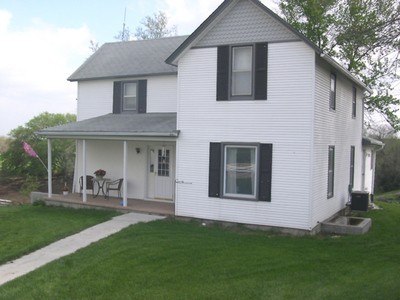 The front of our farm house and my wonderful porch! It looks a bit bare without the flower pots. The plan is to make beds in front and around the right side (west) past the egrees window & A/C unit. 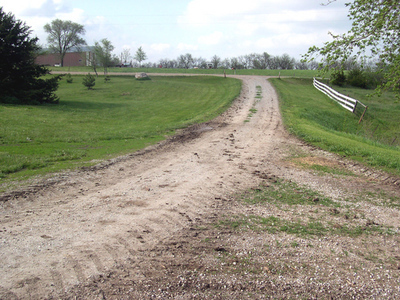 This gives you a better idea of the drive way and how it "Ys". And in the foreground, somewhere under all these weeds there are flowers!! How embarressing!! 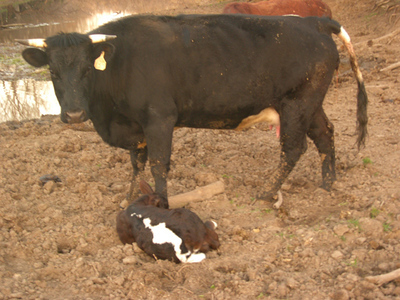 Our "Horny" and her calf. She's not the nicest cow. Kind of an old "rip" but she's a good mama. What can you say but "OOhhhhhhh!" 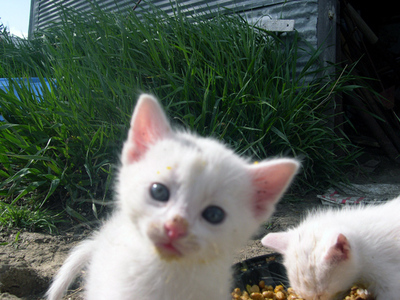 One of three new kittens on the farm. We brought these in for "new blood". And for the twins to play with. I hope you enjoyed our little tour of The Farm. Next time, maybe the quilt studio.